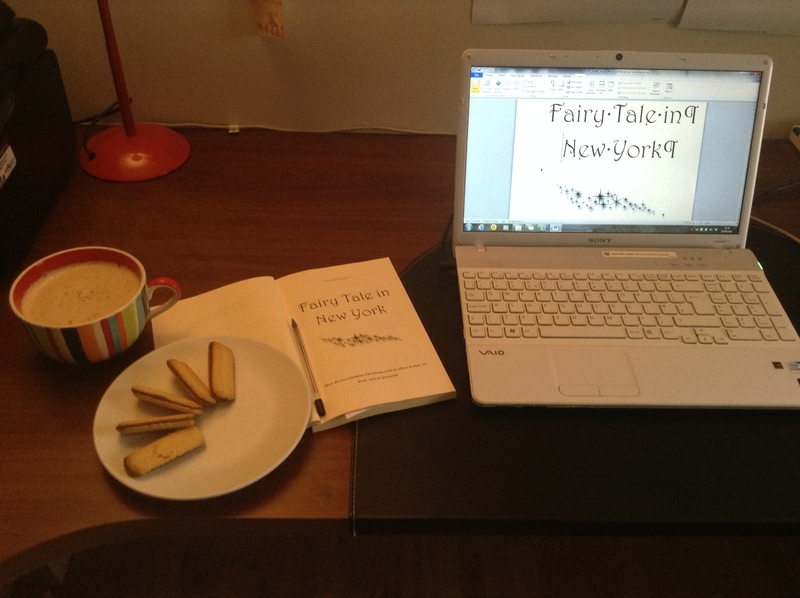 Fairy Tale in New York: Official Launch Day! When someone’s in distress, you give up your flight. When there’s a white-out, you have dinner and hope for the best. When it’s Christmas and you can’t get home… you hope for a miracle. And that’s the essence of Fairy Tale in New York, officially out today! 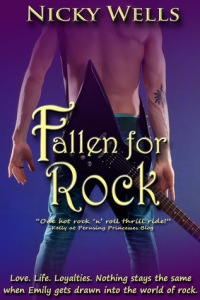 Fairy Tale in New York is an all-out, no-holds-barred, super-sized feel-good and good-cheer Christmas novella featuring a rock star and the girl next door. I know, that’s a lot of adjectives right there. But you see, this is my annual indulgence. I love Christmas. 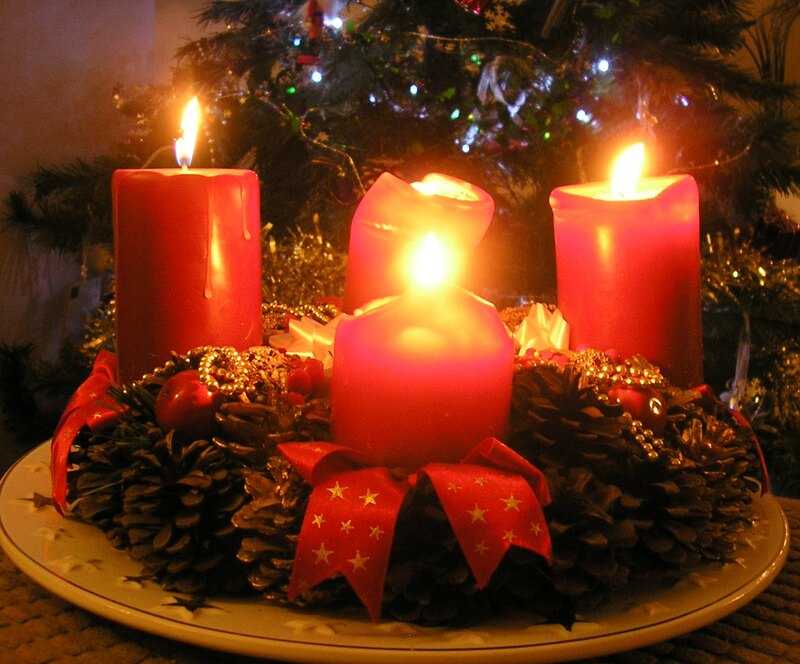 More specifically, I love the run-up to Christmas, the Advent season. The lights, the baking, the weather (yes, the howling gales which allow me to curl up inside with my mulled wine, and the snowy blizzards–if we get any–that draw me outside the make a snowman, I’ll take it all! ), the goodwill, the cheer, the colours. I’m the anti-Grinch. Christmas rocks! Therefore in this Fairy Tale, I really let my hair down. I wanted to bring you the ultimate Christmas book, the one with the crisis and the romance and the great ending. I’m taking you on a flight of fancy, but I can assure you, I did my research, and the key event… well, let’s just say it would be possible. Just! LOL. However, there’s a little more in there for you too. For a start, you can amuse yourself by working out my playlist from the Chapter titles. Have fun! But there’s yet more; there’s a little bit of reflection that grounds the book. For I take my characters (Jude, the rock star in particular) down a road of giving and helping that they’d never previously have considered. It’s all about love, but in more ways than one. (And yes, that one too, although we shall keep our discrete distance this time. It is a Christmas Fairy Tale, not a hot rock romp. LOL). 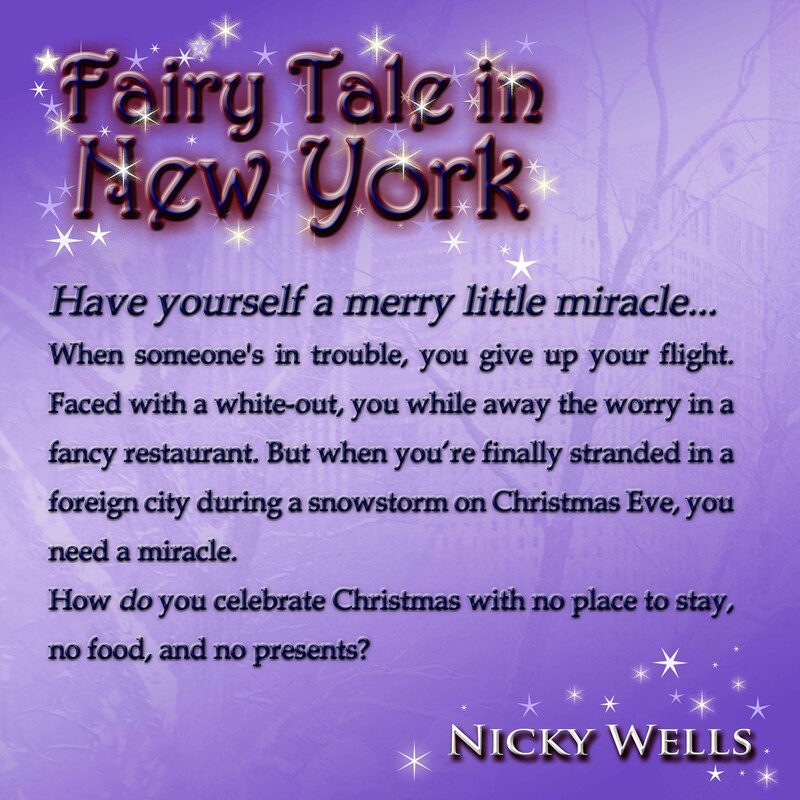 So Fairy Tale in New York tells the story of a perfect Christmas in the most imperfect of circumstances. Here’s the blurb. I wanted to spread some seasonal joy, so check this out! FREE on Kindle for one week from 8 November 2014! $0.99/£0.99 on Kindle for one week from 10 November 2014! Spirits of Christmas is completely FREE on Kindle. How’s that for a mega launch celebration? and thanks for all your support in 2014. Rock on! Yes, you read that right. This is my first free promo EVER. 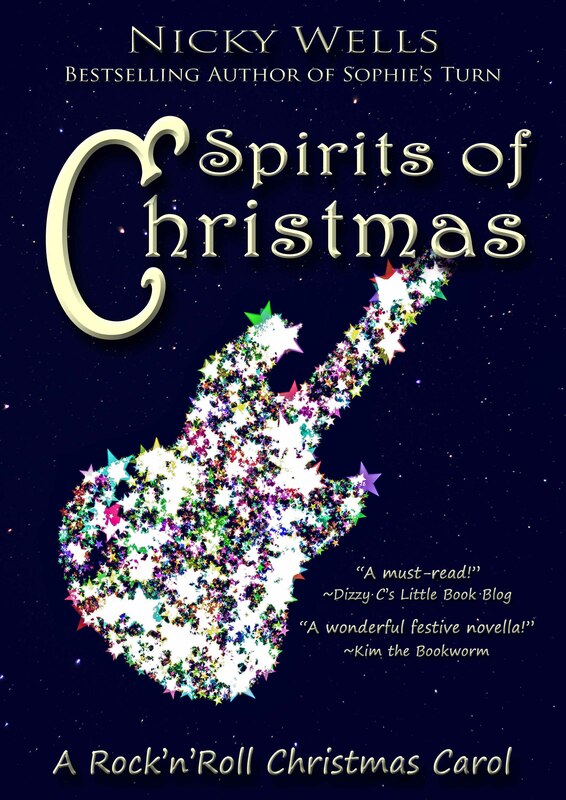 Spirits of Christmas is absolutely free on Kindle for five days only! Easy. Because it’s Christmas (well, getting there!) and I’m celebrating the impending launch of Fairy Tale in New York, which is available for pre-order right now but will officially release on Kindle next Monday for only $2.06 or £1.29. Help spread the word about my free Spirits! 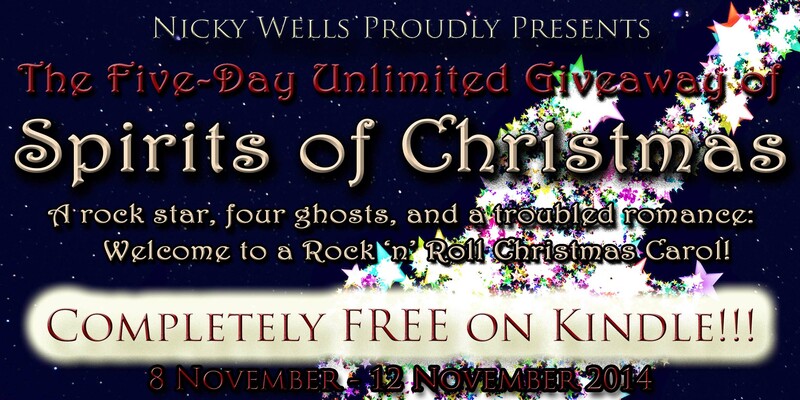 SPIRITS OF CHRISTMAS, rock’n’roll Christmas carol by @WellsNicky #FREE on #KINDLE! http://ow.ly/DXQfW Romance, music & Xmas, go get it! Thank you so much!! Loveya! Add your voice to my Thunderclap for a real **bang**! Have you heard of Thunderclap? By which I mean not the natural phenomenon nor the band, but the social media variety? The one that allows you to bring together 100s of supporters all at the same time to hold a virtual loudhailer to a message you want to share on Twitter or Facebook? Well, it’s awesome. It really is. The possibilities are mind-blowing! Thunderclap is a new ‘crowd-speaking’ platform that allows you to donate a Tweet or Facebook message to an artist’s project… like for example a book launch. Like, for example, my upcoming launch of Fairy Tale in New York. If you pledge, the message is let loose on social media all at the same time. It’s completely safe, it’s not spam, and it will automatically post just one message on your behalf, just once. 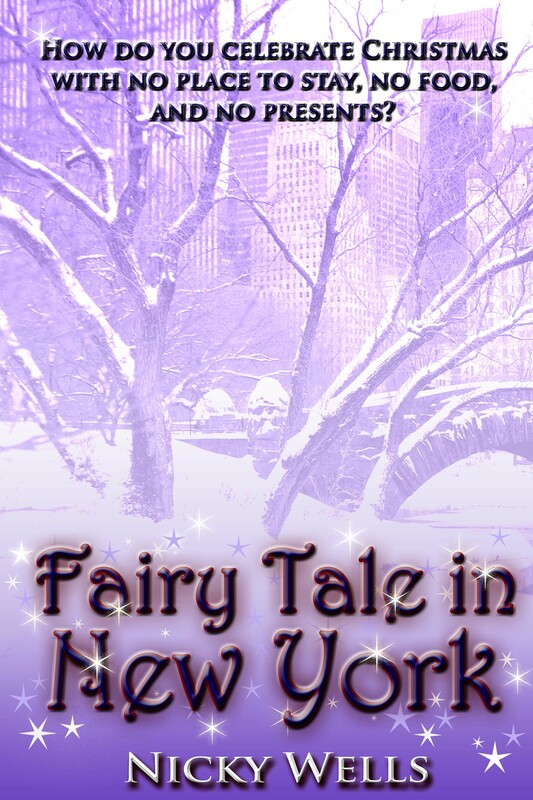 Like, for example, this one I made for Fairy Tale in New York. 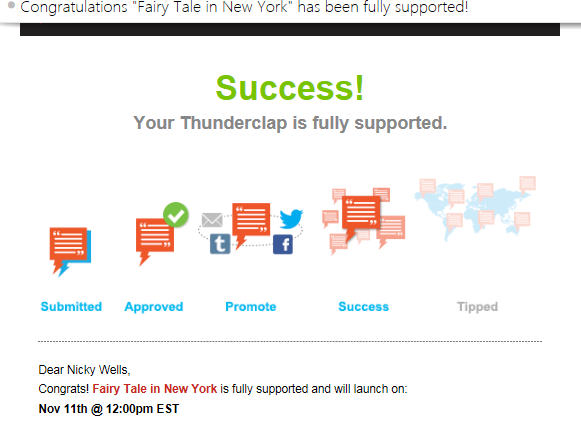 For a Thunderclap to go ahead, you need a minimum of 100 supporters. 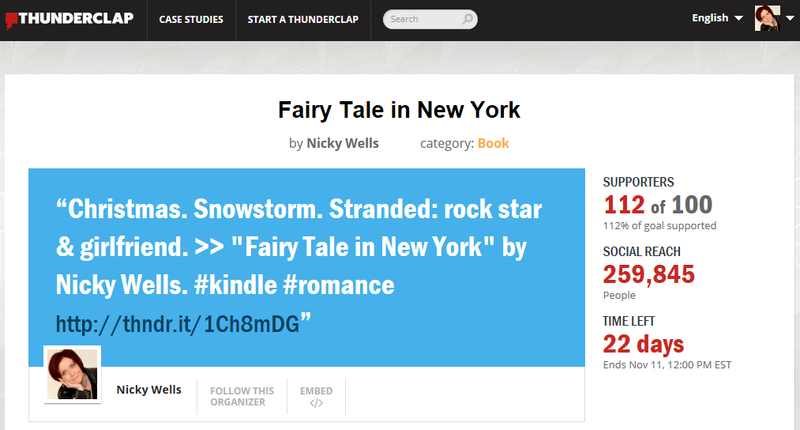 And I’m ecstatically pleased to report that my Thunderclap campaign for Fairy Tale in New York has lift off! 3. Click on ‘support with Twitter’ or ‘Support with Facebook. 4. Confirm by clicking ‘Add my support’. ‘You and your one-track mind.’ Carrie pretended to pout and threw a glove at Jude. Can’t you just picture the scene? Don’t you just wish you could be there? Well, I can’t quite magic you there, but I can invite you to ride along with Carrie and Jude’s incredible rollercoaster of magical events in my latest masterpiece, Fairy Tale in New York. You can order your Fairy Tale already! And guess what… You can pre-order it right now, right here, today! 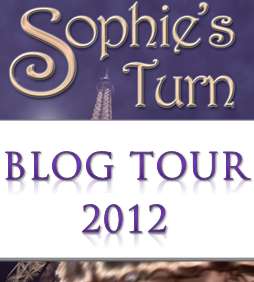 Find it in the UK: http://www.amazon.co.uk/dp/B00O98EMRG/ and the US: http://www.amazon.com/dp/B00O98EMRG/ and, of course, in all other Kindle stores. One-Click today, and the novella will magically appear on your Kindle on its official launch day of 10 November 2014. Rock on through a wonderful festive season, my friends. Loveya! It’s done. 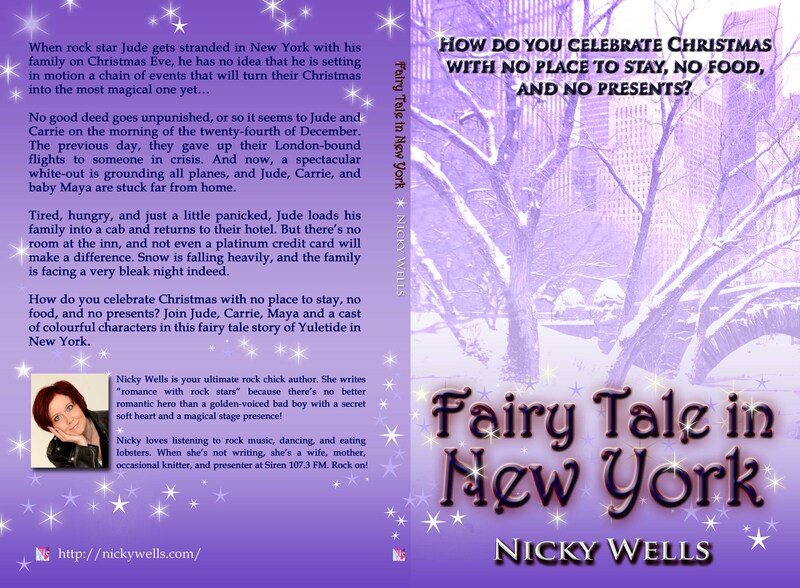 I’ve finally finished editing, proofing, and polishing this year’s Christmas novella, Fairy Tale in New York. The Kindle copy is ready and waiting to be uploaded. The paperback copy is sitting pretty, just aching for me to hit the ‘publish’ button. All systems are go! 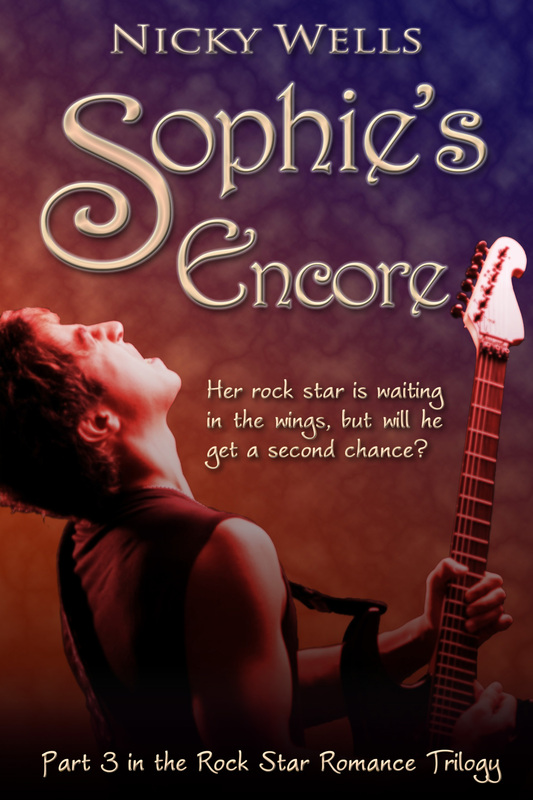 When rock star Jude gets stranded in New York with his family on Christmas Eve, he has no idea that he is setting in motion a chain of events that will turn their Christmas into the most magical one yet.